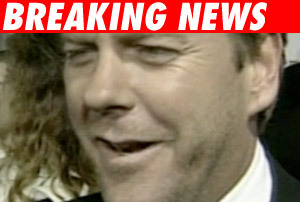 Kiefer Sutherland has just copped a plea in his DUI case. Sutherland did not appear, however -- his high-powered lawyer, Blair Berk, showed up in downtown L.A. and entered a no contest plea to one count of DUI -- driving with a .08 or higher. This is Kiefer's second DUI conviction. Back in 2004, he pled no contest to driving with a .22 blood alcohol level and was sentenced to five years probation. Today's plea means Kiefer violated probation and could be sentenced to a year-and-a-half in the slammer. Get this -- the judge who was supposed to hear the case was Michael Sauer, the same judge who nailed Paris Hilton. Sauer was on vacation today and the ever-wise Berk was able to get the case transferred to Judge Stuart Rice. Judge Rice will sentence Kiefer on December 21. Kiefer's probation is revoked pending the future hearing. Kiefer has been ordered not to drive between November 9 and the December hearing.